This update includes the new Red C poll for the Irish Sun. It becomes increasingly clear that Others and Independents are doing well over the last weeks and months, while Fine Gael support is clearly past its peak. Still, if we take into account the margins of error we cannot be entirely sure that Fine Gael support has dropped in the last few weeks. If more polls confirm the low estimate of 26% in the most recent Red C poll, we would be able to draw that conclusion. Sinn Féin did well in the previous Red C poll (20%), but is now back to 17% again. It is entirely plausible that this was just random error in the data and that Sinn Féin support has remained essentially stable over the last week. As I indicated before: those kinds of movements in a single poll need to be confirmed by other polls before we can draw solid conclusions. You need to take margin of error into account. This update includes the new Red C Research poll for the Sunday Business Post, published today. 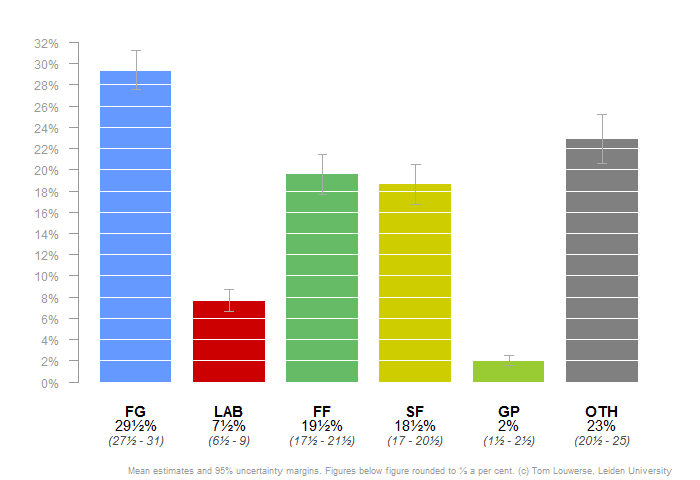 While the overall picture remains the same, it does become increasingly clear that Fine Gael has lost the momentum it gained in the second part of 2015. The party peaked in December and has been declining a little bit since then (although this is still within the uncertainty margin). 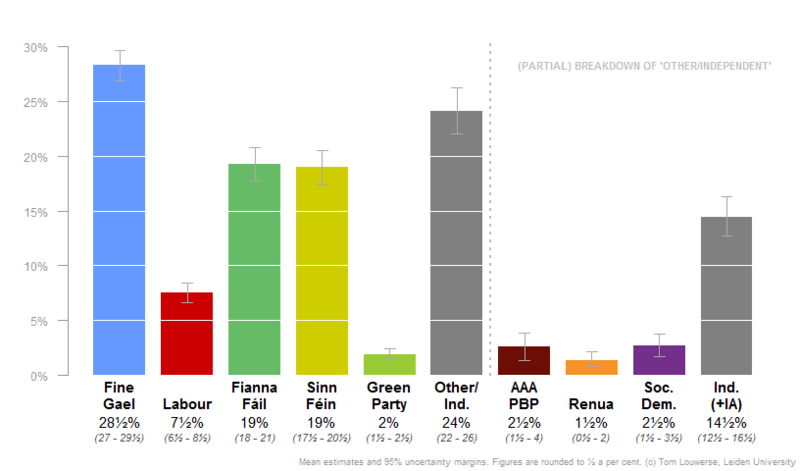 Sinn Féin is up 3 points in the new Red C Research poll, but this does not greatly impact upon the polling average. Sinn Féin's gain in that poll might be true, but it could also be random noise; it's too early to tell. This update includes the new Red C / Paddy Power poll published today. The small (non-significant) changes that occur in that poll do not substantively affect the Polling Indicator estimates. Today the Irish Poling Indicator was updated with two new polls, by Red C Research and Behaviour & Attitudes. Together with the Ipsos MRBI poll published earlier this week, these polls form a cluster of three that has been conducted early this week. On the one hand, this helps us to reduce random error associated with opinion research, but it also makes clear that there are structural differences between pollsters. For example, Red C research has Labour on 10%, while the other two pollsters have the party at 7 or 8%. This is not a one-off: Red C has consistently estimated Labour higher than other pollsters do. New to the Irish Polling Indicator is that for the first time I am breaking down the category of 'Others/independents'. This is somewhat tricky, as these smaller parties have not been consistently included in polls for a very long time. That is why I am taking a two-step approach. The main model for the analysis remains unchanged, including the 'Others/independents' category, which we have consistent data for since 2011. We break this down by analysing data from September 2015 until now. This data is analysed on a party-by-party basis. In fact, the model I am using for this analysis is very similar to what I am using for the Dutch version of the polling indicator. Basically, it takes into account all of the things the regular analysis also looks at, but it does not guarantee that party support will add up exactly to 100% (or in the case of analysing the Others/independents category to whatever the total of that category is on a given day). This is the limitation of this data, but in practise it does not matter that much. 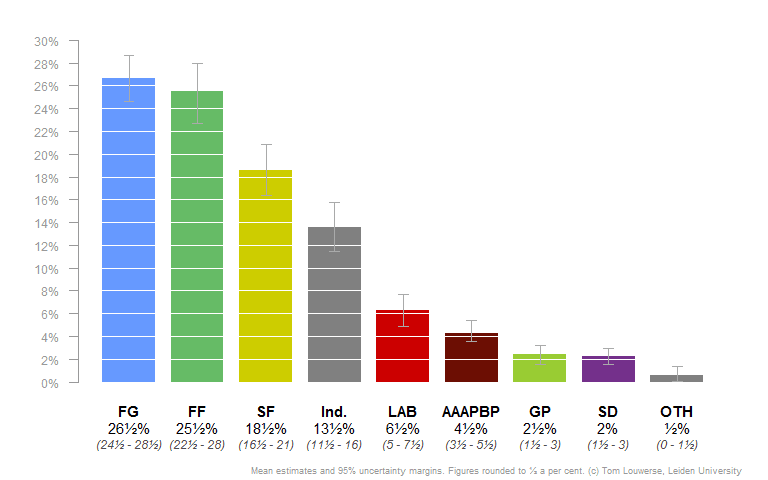 I'll analyse the support for only three of the minor parties and independents, so there will be other even smaller parties that are not included in the breakdown. Therefore the total of Other/Independents is likely to be higher than the sum of the four groups in the breakdown. 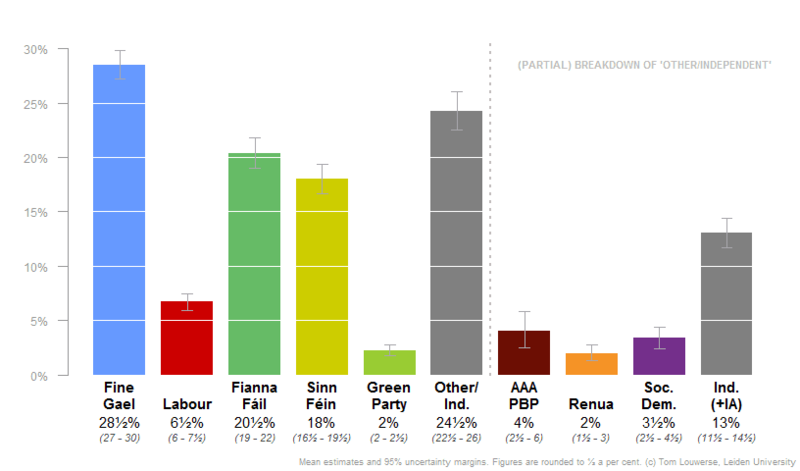 We'll break down the data for AAA-PBP, Renua, Social Democrats and Independents (including the Independent Alliance). The AAA-PBP alliance is currently estimated at about 3.5%. Pollsters made hugely different estimated of their support last year, but current polls are in relative agreement. Renua is at 1%, which is also quite consistent between polls. The Social Democrats are currently estimated at 2.5%, which seems a slight improvement over earlier this year. The group of Independents, including the Independent Alliance, is estimated at about 13.5%. 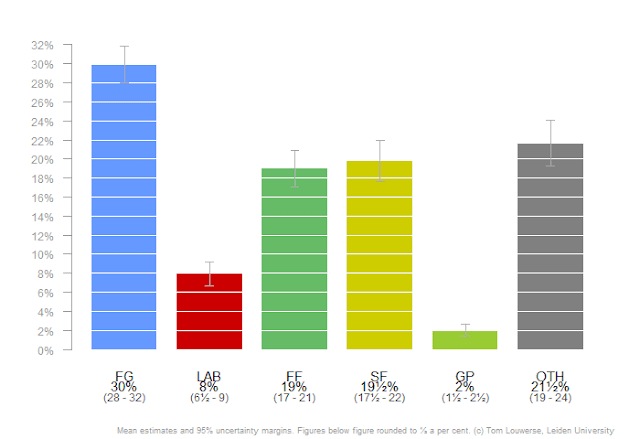 Note that Ipsos MRBI has them somewhat lower at 11%, while Red C has this group of candidates at about 16%. Again, this is a pattern that is not unique to the latest set of polls: Red C Research have put the group of Independents/IA higher than other pollsters, in particular Ipsos MRBI, for at least six months. This Polling Indicator has been updated with the newest Ipsos MRBI poll. It does not significantly alter our estimates of the parties' standing. Independents/Others seem to do a bit better recently, but this increase in support is still within the margin of error. The Irish Polling Indicator has been updated with the new Sunday Business Post/Red C poll that was published on 30 January.